House of Mania is the northern wing of the New Sheoth Palace, and the seat of power for the dukedom of Mania. The wing consists of three different areas: the House of Mania proper, the Duke's Quarters and the Halcyon Conservatory. The main chamber of the House is a is an oval-shaped room with an extremely high ceiling and grand architecture designed to exemplify the Duke's power. The whole room is covered with tapestries and carpets in the color scheme of Mania and Golden Saints guard the entrances. Duke Thadon holds court in the eastern end of the chamber, where his majestic throne and dining table can be found. Doors from here lead to the Palace of Sheogorath, the Palace grounds, the Halcyon Conservatory. The corridor departing from the northern side of the chamber leads to a secondary entrance to the Conservatory and the private quarters of the House's servants. 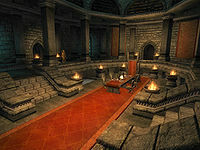 Next to the double bed where Wide-Eye and Gundlar sleep is a table with a copy of Myths of Sheogorath, a bottle of Fellmoor spore wine and three lockpicks. Scattered around the room are various samples of food, wine, and clothing; as well as two petty soul gems next to the Sheogorath bust. 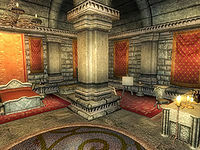 The two sacks next to the bed and the two cupboards in the western area do not respawn, and the latter two also contain a small chance of an oddity. The chest in the southwestern corner contains a good deal of leveled loot. The Duke's Quarters can only be accessed from the House by transiting through the Halcyon Conservatory. The door is locked but can be opened by the House of Mania key; entering is considered to be trespassing, unless you have completed Ritual of Mania. Inside you will have to deal with two patrolling Golden Saints by either killing them or sneaking past them. After going down the stairs you have three options: head left and straight to the kitchen through a corridor filled with busts and storage, left and then right to the bedroom or straight ahead to the alchemy room. The alchemy room mainly consists of a large counter laden with peculiar plants and ingredients from the Isles along with a novice alembic, an apprentice mortar & pestle, a journeyman calcinator and a petty and a lesser soul gem. The kitchen is well stocked with plenty of food containers, two massive kegs and a large selection of drinks. Three greenmote urns ensure Thadon's favorite treat is always at hand. Gundlar prepares Thadon's meal here every day at 7pm. The bedroom consists of a double bed, a painting area with canvasses and paint brushes and a drinking table with three bottles of Fellmoor spore wine. Two more bottles can be found on a bed side table, along with a portion of greenmote. On a counter nearby are a ruby and a sapphire. The chest next to the bed and the chest and urn next to the drinking table all contain good leveled loot. All containers in the room do not respawn. 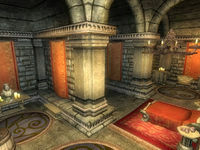 In the bust-laden corridor is a library area where you can find the Acrobatics skill book The Black Arrow, v 1 and the Sneak skill book Sacred Witness.